We have spent most of our winter holidays in Finnish Lapland. This time we decided to try something else. 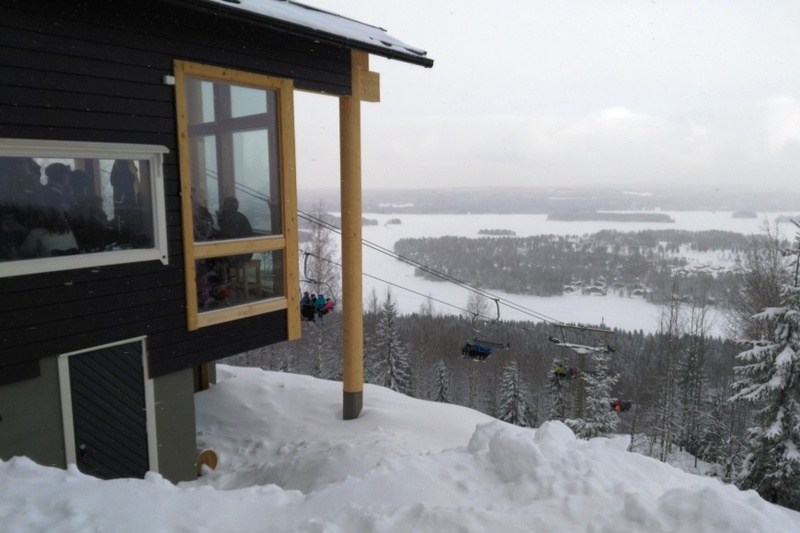 We headed to the heart of the Lakeland area of Finland: Tahko Ski Resort in Nilsiä, in Northern Savonia. We had visited Tahko once before in summertime, and we were just thinking that Tahko was a liitle bit like Alpine village in Austria, where we have visited earlier. Tahko is located approx. 11 km from the center of Nilsiä and approx. 65 km from the center of Kuopio city - the capital of Savonia. 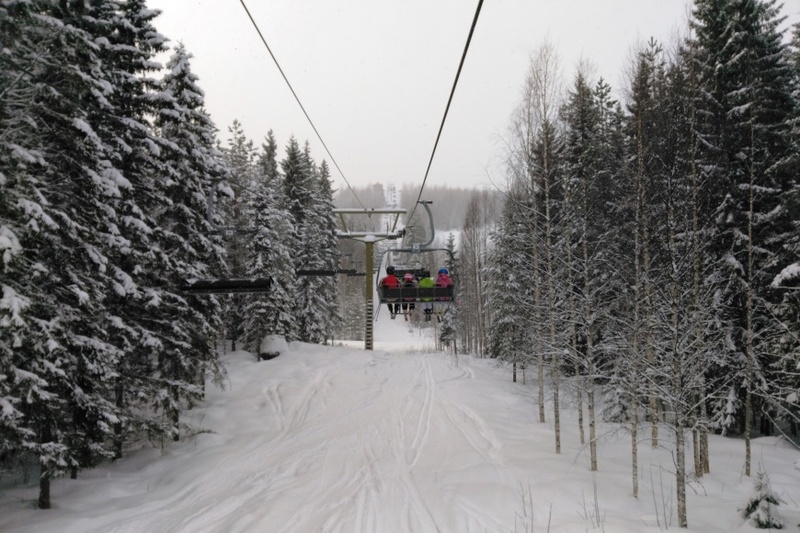 Tahko is one of the largest and most diverse ski resort compared to those in Southern and Central Finland. Tahko slope has up to 200 meters elevation difference. Tahko has slopes for skiers of different levels in both sides of Tahko mountain. Eetu 5 yrs were practicing snowboarding with mother, while Aada 9 yrs explored the bigger slopes with dad. A slight children's slope with a carpet lift at the bottom of the front slope was just perfect for the beginner. The front slopes on the left may be too challenging for beginners. Most gentle slopes - 700-meter-long 'Westerns easy', that was opened last season, can be found on the other side of Tahko, on the West slopes. Tahko offers plenty of indoor activities at Tahko Spa centre: a bowling hall, gym, fitness center and a multifunctional arena, where you can play indoor games: badminton, table tennis, floorball and football. A surprisingly wide setting of everything! If you don’t have your own sports equipment with you, you can rent cross-country skiing and ski equipment as well as snow shoes and toboggan from Tahko’s SciMac Promenade and SciMac Tirol Ski Rentals. We stayed at Tahko Spa Hotel's stylish Vuori Apartment of two bedrooms, a living area, fully equipped kitchen, a sauna and a glassed-in balcony with great views directly to the Tahko slopes. Each apartment has an external storage place for skiing equipment on the ground floor. The apartment was equipped also with two tellys, a washing machine and a drying machine. A breakfast at Tahko Spa Hotel Restaurant Trattoria was plentiful and tasty with fresh bread, fruits, and the American-style pancake and with real croissants! The breakfast is offered at an additional fee. After a long day on the slopes it was nice to go to a spa in the evening. The children were very excited about it - they had waited for it long before our arrival to Tahko. Although the day had been long, they were full of energy. There are four pools at Tahko Spa, one for the smallest children's water play, the other for older children and a third 140-meter-deep for childrenm who can swim. For adults and for active swimmers there are a 25 m pool – added with a flatable Wibit water adventure course during the high season. The Spa also has a Jacuzzi, a waterslide and a pool bar. Tahko Spa is really good for families with children. Outside the high season there ais even more space for adults to relax in jacuzzis. The skiing tracks of Tahko area were in really good condition. There was surprisingly tranquil in skiing tracks, so it was nice to enjoy views and voices of the nature. We made a skiing trip to a skiing café "Latukahvio" near Tahko. The café is known for its delicious “Munkki" -donuts. The entrepreneurs Pertti and Päivi Huovinen arrange also reindeer safaris. A distance from Tahko center to skiing café and back were approx. 9 km. Thanks to Tahko’s well maintained skiing tracks the trip was a nice experience also for children. The best thing was that we were allowed to touch and feed the animals with carrots and apples that we received from the reception - however, following the certain rules. In addition to Tahko Farm petting zoo and its activities, entrepeneurs Hannu Puustinen and his wife Minna Kirjavainen-Puustinen offer cottage accommodation. Hannu recommended to try a frozen toboggan hill close to the farm. Use of a helmet is recommended especially for smaller children. Tahko Farm arranges horse safaris, pony ride, riding lessons, buggy ride etc. at an additional fee. Tahko Farm is open all year round. Next to Tahko Spa there is an activity park that combines a sport ground and a playground with different game equipment, a wire rope glider and parkour area. In winter, if the weather permits, there is a skating rink in the park. In Tahko area you can find also babysitting services and a pet hotel. Tahko has plenty of nice restaurants. We did not have time to visit as many as we would have wanted. Restaurant Tirol, at the sub-station of Tahko front slopes, was one of our favorites. The atmosphere in Tirol was like in alpine village. The dim lighting and a real fire in the fireplace brought to the restaurant warm and welcoming atmosphere. Also, the service was fast and friendly. Tirol restaurant had been renewed for this season. The ownership had changed as well as the menu, being now more classy. During the high season Restaurant Tirol organizes children's discos and candy lotteries. An lunch time of our alpine skiing day, we visited Restaurant Kaisla, which impressed us with its tasty homemade food and delicious pastries. The restaurant is located next to the Piazza Restaurant, just along the skiing tracks, near the gulf and skiing tracks. Last but not least, we enjoyed lunch in Restaurant Rehti. Rehti’s entrepreneurs Ilkka and Raili Aapajärvi and daughter Suvi Valtonen invest in genuine tastes and in raw materials of high-quality. The Restaurant is open all year-round. Children’s menu is one of a kind. Tahko Panorama Bar & Cafe on the top of the front slopes has expanded its facilities to 70 seats. Also UKKO Restaurant at the heart of Tahko center was re-opened in December 2016. Other popular restaurants in Tahko are Break Sokos Hotel Tahko’s Restaurant Hillside, and Restaurant Mosquito serving American cuisine and Mexican flavors. Tahko has great performers through the season. Tahko is a nice and compact ski resort. A good thing in Tahko is that everything you need is close to you: skiing slopes, cross-country skiing tracks, restaurants, grocery stores, Spa and Tahko Farm. We didn't need our car at all during our 4-day holiday. Tahko seems to be a good and versatile holiday destination for families all year round. We received very good benefits with Tahko Kids bracelets: children's theater was free of charge as well as desserts in a few restaurants. The bracelets are available in certain seasons. Our kids liked most the chair lift of skiing slopes, and the water slide of Tahko Spa. We (adults) were impressed by Tahko's well maintained cross-country skiing tracks and friendly service. We would have enjoyed a longer stay in Tahko. LikeFinland.com is a nationwide leisure time media and search service of Finnish destinations. You can like us in Facebook or follow in Twitter and Instagram. Our main website in Finnish is www.KivaaTekemista.fi. › What a snowfun! 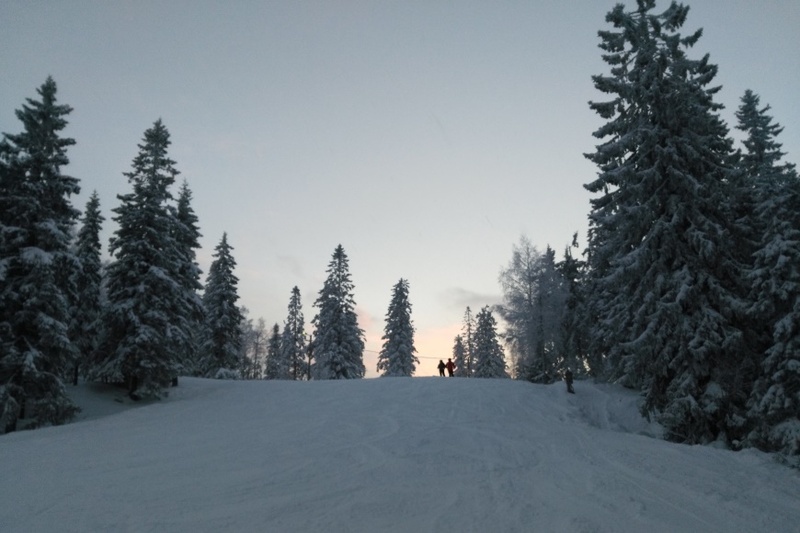 We spent a lovely day in Talma Ski Center – only a few kilometers from Helsinki! › Tiina visited Lapland - see the magnificent photos of polar night! › Destination of the Month: Pallas - Snowshoeing in the heart of Lapland! › Destination of the Month: Mariehamn surprised us totally also in winter! › Wanna hideaway? Why not Elves Hideaway! Peaceful nature destination near Levi! › Destination of the Month: Finnish nature at its best in Sauvo – Spend the night in a tree and enjoy some burgers! › Destination of the Month: Enjoy the Finnish countryside by staying in Villa Sibbe and dine at Restaurant Veljekset in Sipoo! › Destination of the Month: Lapland at its best – visiting Elves Village and enjoying nature in Levi! › Fun things to do in Helsinki area at Christmas time! › We visited Snow Playground Talma near Helsinki! › Scandinavia's first virtual reality park Pikseli Arcade was opened in Vantaa! › LikeFinland explored a new adventure destination in Tampere: Prison Island!